Tweaker is new performance and DJ controller designed with NI Traktor and Ableton Live users in mind. We got our first look at the MIDI device at NAMM back in January, but it's now available to buy. 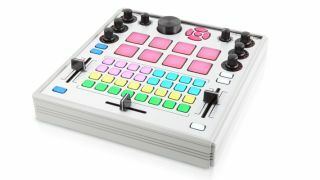 It features a 32-button grid, velocity sensitive pads, push encoders with LED rings and a 2-channel DJ mixer style interface. All controls feature bright LED colour coding for visual feedback. It ships with an LE version of Traktor, plus mappings for Ableton Live and Serato Scratch. The Tweaker is available now at an RRP of $399. For more info visit the Electrix official site.